Two days into my new job at an international school and I’m already doing my homework looking at how other teachers manage the mix of students that can be found in classes that don’t share a native language. I stumbled across this video and it’s the first one that I actually watched in its entirety and I found it really interesting. Worth a watch – this teacher knows what she’s doing. Despite not knowing the names of all of these students you will develop a sense of getting to know them, both in the sense of the group dynamic of that particular class group; the ‘hyper’ class, the ‘boring’ class, the ‘good’ class; and as individuals. I have found that there are a set of different categories that each student tends to fall into, feeding on a range of influences including attitude, behaviour, appearance and even where they choose to sit. Based on my own experiences over the past year as a TEFL teacher, five years working with young people in the UK and the quickly fading memories of studying group dynamics and experiential learning at university, I have drawn some observations of the typical students you will find in each and every class. I was going to put them all into one mammoth post but to save your eyes, minds and time I will give it to you bit by bit. Starting with one of my favourites; The Buffalo Boy. 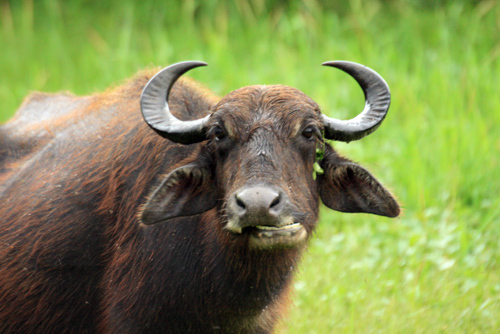 In Thailand the buffalo is associated with stupidity and slowness. Daily we see men walking their buffalo along the road, leading them from field to field, where they will munch on grass and swat flies with their tails. We aren’t talking majestic fighting buffalo here – just the plain old, slightly muddy, pooing in the road type of buffalo. The name may be specific to Thailand but each group needs it’s Buffalo Boy – if you can’t think of one when you look back at your classes at school then unfortunately you were it. I refer to this character as The Buffalo Boy as it will almost always be a boy, he will be overweight (not in a big boned way but a poor lifestyle, too much crappy food and no exercise way) and will usually carry a slightly lost, gormless look on his face (look at any image of a real buffalo for a pretty good representation of this expression). Communication is reduced to caveman style grunts, punches and other random, laboured movements that sometimes fool you into thinking he may be about to participate but he is actually only shifting from left to right bum cheek. He will usually sit middle left – just in front of the monkey boys that reside in back left as he doesn’t quite have the energy to be fully part of that pack. He can be easily led by them and often any loutish behaviour from him is inspired by their whisperings and suggestions. He is also often the scapegoat of the class, with blame being thrust at him from all surrounding corners of the classroom. A middle seat is pretty middle-of-the-road though, and he chooses this neutral ground because really he isn’t choosing to be The Buffalo Boy, and so it isn’t an attention thing – he would rather sit and disappear into the crowd. I love to get The Buffalo Boy up to the front as much as possible. When pushed, he is able to join in and the whole class will cheer every time he utters a word in English. It also gives me a chance to actually hear him speak and to check that he is kind of maybe following what is going on. He may even crack a smile. Most of the time the case is that he isn’t completely stupid, he just doesn’t have the energy, enthusiasm or get up and go to join in at will. With a little persuasion he can fly! OK, scrap that – have you ever seen a buffalo fly? He can at least plod along. Do you have a Buffalo Boy in your classroom? Oh, exam week. How I look forward to your respite from teaching, but how I loathe your lack of stimulus. A lot of TEFL teachers at other schools don’t have to go in during exam week, but our school likes to make us come in and sit and do nothing. This year they also insisted that we submit lesson plans for the whole semester so I don’t even have much planning to do. I’ve already marked my papers from last week and the rest of my students don’t sit their exams until Friday afternoon so I won’t be getting those back until next week – I literally have nothing to do! Thankfully we now have the internet (after a month or so of nothing) so at least I can watch crap on youtube and generally waste time. Today I watched Les Miserables which took up three hours of the morning nicely but was probably a little too intense for Monday morning viewing. Maybe it’s my turn for a nap…! The Olympics… coming to Thailand!!!!!!! I feel like I haven’t blogged for a while (how many times have a started a post in a similar manner to this???) but whatever. OK so I missed the weekly news feature I started specifically to give me something to write about at least once a week but to be honest this past week has only seen pretty serious stuff in the news – a roadside bomb went off in my province which is the closest to us that the insurgency violence has reached. So the news was mostly about that bomb, another shooting (of a mother and 2 year old child – both survived) and some other bombs deeper south. I like to choose a story with at least a humorous twist so maybe it was best that I steered clear from that one. I’m currently sitting at my desk at school watching the clock until it’s 4pm and home time. For the past month lessons have been reduced to 40 minutes to allow for time at the end of the day for students to practice for the most important event of the school calendar – SPORTS DAY. Sports day is an epic 2 day event with an opening ceremony and a parade through the city centre. Right now I can hear a couple hundred students chanting in unison and banging drums in preparation for the opening ceremony. They sound like an army out there! Having reduced lesson time firstly was an annoyance – 40 minutes wasn’t enough when you take into consideration the fact that students are always 5 minutes late, often 10 minutes and sometimes 15 minutes late. However, now I have honed the skills of teaching all the key information needed in some pretty effective micro-lessons. Plus, the school are aware that we will get less done with the students while lessons are cut down so its not like they have super high expectations for what we will achieve this month. It’s still slightly annoying though as midterm exams are next week so the extra time would have been helpful to squeeze in as much as I could – and of course 3 whole days of school have been cancelled to make way for the Olympic-style extravaganza, too. It sound like it will be really impressive though – I am looking forward to it. So, since I got annoyed with not being involved properly in the Wei Kru ceremony I think my Thai assistants have taken note. After being part of the Malaysian visit with my choir, now I am included in the sports day parade. Yay! This involves being at school at 4am to start getting ready. WHAT!!! I almost said no but after getting so pissed off about not being involved in whole school activities I have to do this. Plus I will be getting dressed up in traditional Thai dress which will make for a perfect photo opportunity! Expect an update very soon about Hatyairatprachasun School’s own Olympics! Here’s a couple of pics from the weekend… that I have stolen from Bronte and Soda’s facebooks thanks guys, I am too lazy to upload mine yet) it was my friend Sarha’s 30th birthday and among many things we went to a lovely waterfall, had a sunset dinner and a wine fuelled cake fight. Oh, wine how I have missed thee. The Malaysians are in the house (or why I now hate Barry Manilow). It can be said of many Thai schools that appearances prevail over actual reality. And so, with an important visit from a Malaysian school and the signing of a Memorandom of Cooperation (whatever that it) imminent, my school went into overload in preparation. Lessons were cancelled to give way for all important ceremonial rehearsals. It is evidently more important to look like a good school than to actually be one. Much more preferable to skip on teaching students but have a beautiful ceremony instead. Earlier this term myself and a Filipino teacher were asked to create a choir who will be taught English language songs to perform at school events. We got excited with visions of an auditions process and being able to select the best singers from across the school… until we were told that it would only be selected students who are on special English programmes – not necessarily students that can sing, or want to. We chose a simple, easy song to teach them first off – Can’t Smile Withou You by Barry Manilow. We even tried our luck introducing a 2 part section in the final chorus. They were OK. Not amazing, but not awful. We then discovered that these students would be performing at the all-important visit from the Malaysian school. Rehearsals were arranged (without asking us first…. grrrr) for before and after school. Strict instructions were given that they must be perfect – ironically these instuctions came from the same mouth that wouldn’t let us freely choose students based on their skills and willingness to participate. Suddenly our little weekly sing song club rocketed into twice daily rehearsals, with massive pressure on the poor kids. I became conductress (although I had no control over anything as a certain someone would continue to give orders from beind me – grrrr again). I can now say I am 100% sick of Can’t Smile Without You, and of Barry Manilow. Had we known we would be singing it 10+ times a day maybe we would have picked something a bit better. I know I am moaning about it all but actually I was happy to be asked to do something outside of the Foreign Teacher’s Department. 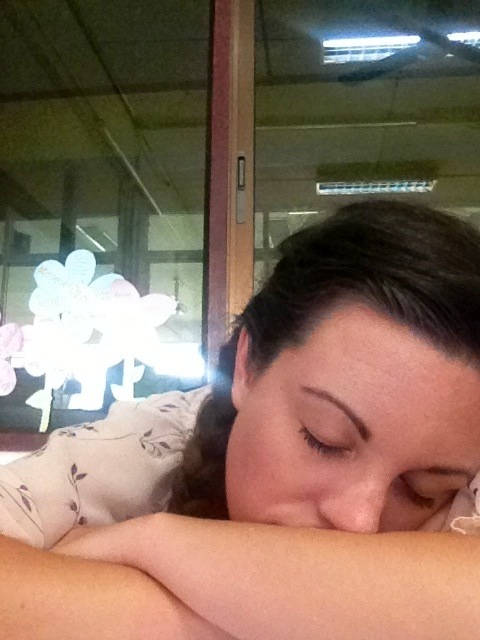 This time my involvement in a whole school activity was actually because they wanted me and not just through sympathy…! Anyway, yesterday the coveted visit took place. We were issued with special blazers to wear and had flowers pinned to our lapels. The performance actually went really well – OK, they weren’t prefect but all things considered I couldn’t be prouder of our little choir. We weren’t able to see much of the day’s events as we were instructed to siply wait for our cue, file in, perform and file back out again – heaven forbid we hang around and make the place look messy!